Gender and women in Shakespeare are hot topics. In recent years, the Toronto area theatre scene has featured a number of Shakespeare productions with women playing men’s roles. Women have played Lear, Prospero, and Romeo to name a few. 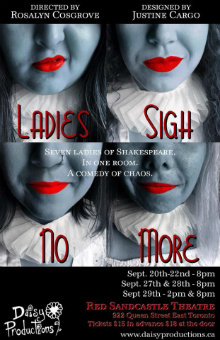 Daisy Productions’ new play, Ladies Sigh No More, on stage now at The Red Sandcastle Theatre, is a different take on the role of women in Shakespeare. Instead of playing with casting, Ladies Sigh No More imagines what would happen if seven of Shakespeare’s female characters were put together in one room. It’s a hilariously funny look at the Bard, the afterlife, and female empowerment. The play opens on four women in white nightgowns lounging around some sort of rec room. Two are playing chess, one is reading magazines, and one is making a pile of colourful flowers out of pipe cleaners. They are soon joined by three others. We learn that these seven women are all Shakespearean characters, and they are all dead. They’ve somehow ended up together in a purgatorial mental hospital to work out their issues and free themselves from their pasts through group therapy and role playing. The premise is a little preposterous but it works and is very funny. Thomas Hischak’s script is briskly paced, blending contemporary language with just enough Shakespearean text and references to make the characters easily recognizable. I think a basic familiarity with some of the most well-known Shakespeare plays would help in getting the jokes, but a deep knowledge is definitely not necessary. My companion and I both thought the cast was terrific. I particularly liked Katie Scharf as Kate from Taming of the Shrew. She played her as a streetwise Italian New Yorker who doesn’t take crap from anyone. Hannah Wayne-Phillip as Lady Macbeth was a power-hungry Scot with a guilt complex. She ruthlessly channels her ambition into every game of Monopoly. Jackie Mahoney, as Lady Anne from Richard III, starts out prim and vulnerable. She finds inner strength and seizes her own destiny as she role plays an alternative ending to her story. The Red Sandcastle Theatre is a small space which puts you up close to the performers. I liked how the actors took advantage of that intimacy with occasional interactions with the audience that seemed natural and totally in character. Our only complaint with Ladies Sigh No More is that some of the characters had only one note and one joke. Ophelia (Kelly Taylor) is obsessed with flowers. Desdemona (Madelaine Rose) is constantly searching for her handkerchief. We wanted to hear more from all of the characters and to find out how they would resolve their conflicts. But all in all, Ladies Sigh No More is a ton of fun. It’s a wacky exploration of some very familiar characters. And while light-hearted, it prompts you to imagine what might have been had these women had each other to help them stand up for themselves. Ladies Sigh No More is playing at The Red Sandcastle Theatre (922 Queen Street East) until September 29, 2018. Performances are Thursday – Saturday at 8pm with a matinee at 2pm on September 29. I saw this play because of this positive review, and I have to say that I was overall rather disappointed in the production. About half of the actors were flat and stiff in their deliveries (including the girl playing Ophelia and the larger Indian girl) and this felt like a very amateur production overall. The parts that stood out as more professional to me were the technical elements, including the stage and lighting design. As much as I want to encourage more work created by and for women… I would strongly encourage some of this cast to invest in more professional acting training first.